Yoursphere is a great way for your tweens and teens to keep busy this summer. My son has joined. It free to join. My son enjoys playing free games, and meeting new friends his age. He has been a little sad because he graduated from 5th grade and is going to middle school. A middle school he did not choose to go to, and where none of his friends are going. He has really enjoyed playing on Yoursphere. And I really like that I can manage and see what he does. It is parent and kid-friendly, not like letting them use facebook or myspace. I have no problem with facebook or myspace as I love using my accounts, but I fear that there could be a danger for kids on those sites. 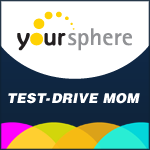 SO if you are looking for a safe site for your kiddos, try Yoursphere. ***Disclosure-I wrote this review while participating in the Yoursphere Test Drive program by Mom Central on behalf of Yoursphere. I received a free lifetime Gold membership on Yoursphere.com, Yoursphere t-shirts, and a $50 American Express gift card to facilitate my review.